A tragic incident took place at the circus of the city of Bishkek, the capital of Kyrgyzstan. A bear attacked two people during rehearsals. The animal killed one person and mauled another one. The bear was shot dead. “The reason for the animal’s aggression is not known. The director of the circus asked the police to shoot the animal dead afterwards,” a source at local law-enforcement authorities said. 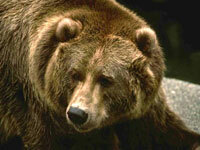 It is worthy of note that bears, unlike feline predators, never show any signs of their intention to attack. The administrator of the circus troupe, a 25-year-old man identified as Dmitry Potapov, died of severe injuries. The animal trainer, Yevgeny Popov, 29, was hospitalized in severe condition.